Across Sub-Saharan Africa, contemporary art remains particularly influenced by the agglomeration of historical and political forces that have shaped the country in question. In Europe art patronage has been dominated by the tastes and demands of bourgeois collectors for centuries: the art market. Given the relative fluidity of European culture and tastes since the 20th century, and the transition of art into a marketplace of ideas and concepts, today’s British art is increasingly conceptual, and cannot be recognised as distinct from, say, the German equivalent in terms of form. Expressions of cultural or national difference have been replaced instead by highly individualistic, polymorphous pieces that may ‘represent’ specific ideas pertaining to contemporary Western society. In Black Africa this kind of art market and its vagaries has not developed to the same extent. Only in the past few decades has an urban middle class consumer emerged. But where sustained royal patronage did exist in Africa, patterns of artistic production have largely resisted recent economic developments. Countries like Mali, Nigeria, Sierra Leone, Côte D’Ivoire and Congo, held robust patronage networks based around strong, centralized traditional patterns of authority. Under such powerful systems of rule the arts could flourish. The kingdom of Benin, for example, covering parts of contemporary Nigeria, Benin, Togo and Ghana, reached its imperial and artistic zenith in the 15th century, producing the famous bronze wall plaques and life-sized bronze heads of their Obas of Benin (King). Even after the kingdom’s decline from the 16th century, a deeply-rooted culture for anthropomorphic sculpture and design had been developed. The Ga people of Ghana claim their descent from the kingdom of Benin and have continued to produce stunning face masks through the 19th and 20th centuries up to today. Neither Kenya nor Uganda’s precolonial ethnic groups had the unified, centralized organization or the sustained political and economic strength to develop such lasting art patronage networks. “Uganda is not very well known for having a strong plastic [figurative] arts tradition” says George Kyeyune, Ugandan artist, scholar and teacher, and former Dean of Makerere University School of Fine Art. “If you start with West Africa and Congo, we [Uganda] don’t have the masks, we don’t have the masquerades, we don’t have the bronze casts. We didn’t inherit that”. Relatively few precolonial statuettes and masks have been discovered in Eastern Africa compared to those along the heavily forested southern belt of West and Central Africa. But this dearth of traditional production has allowed Uganda and Kenya more scope to create afresh, as literacy, urbanization and a growing consumerism brought new kinds of artist, art and collector to the scene. Kyeyune, who holds a PhD on ‘Art in Uganda’ from the School of Oriental and African Studies (SOAS), gives me an overview of the evolution of Ugandan art since independence. 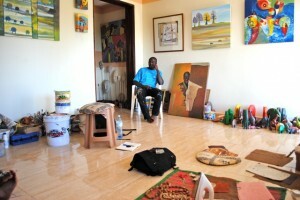 He speaks quietly from his office-come-studio on Makerere campus, where he continues to write, paint and teach. “From the 1970s onwards, when Idi Amin took power, a lot of things went to the dogs…” he reflects. “The subject matter changed. It became morbid. The colours used were very dark”. Art became a tool for protest. Kyeyune told me skeletons were commonly depicted in 1970s visual arts. The 1980s became a decade of “self-reflection”, where artists “showed disgust with their leaders”, emphasising Francis Nnaggenda’s work in particular. But by the 1990s, Yoweri Museveni’s party, the National Resistance Movement, had brought stability and a liberalised, growing economy. Artists reacted positively to this freedom; they began experimenting in form and style, using new motifs, textures and colours. 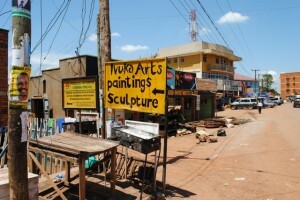 If a period can, the 1990s represented “some kind of avant garde for Ugandan art” says Kyeyune. Ronex Ahimbisibwe’s work conveys the diversity and complexity of Uganda’s new generation of artists. Short and wide-eyed, Ronex shows me around his house and studio near Makerere as dusk falls upon Kampala. It’s a temple to creativity; inside, a photography studio, walls covered in paintings and rooms filled with home-made furniture. The actual studio is crammed with mixed media artistry: pixelated images, collages, barkcloth, rollers, powder and binder liquid, acryllic – these are the diverse media and textures he adopts to conjure his visual art. Around the grounds outside lie metal carcasses: sculptures or furniture half-produced. 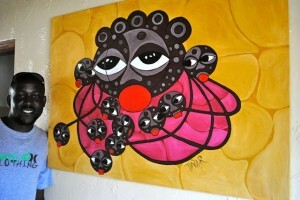 Artists like Ronnie Tindi also promote the new vibrancy in Ugandan art. Tindi hails from western Uganda, from the Banyankole (President Yoweri Museveni’s clan), but has lived in Kampala for years, now working at the Njovu Studio in Bukoto district. Tindi’s most striking paintings are strange, fantastical African faces, an indigenous take on pop art, with bright red lips and a brash originality that’s perhaps at odds with his gentle demeanour. Donald Wasswa is another young artist whose work is abstract but milder on the eye. For the past few years he’s been painting or what he calls ‘masking’ magical, childish scenes of floating elephants among trees. The originality of these pieces, sometimes using pen, coffee, magazines and acrylic, reflect his desire to move beyond an art scene that deals in the tourist or ex-pat trade, confined to commercial pictures of cockerels and African women in primary colours. “Lots of artists today find shortcuts” says Kyeyune. “They use colours with rollers, iconic features – geckos, fish – in some cases it becomes a bit of a cliché. There is little attention to detail”. “Artists are starting to realise some of the problems that need to be rectified” says Wasswa. 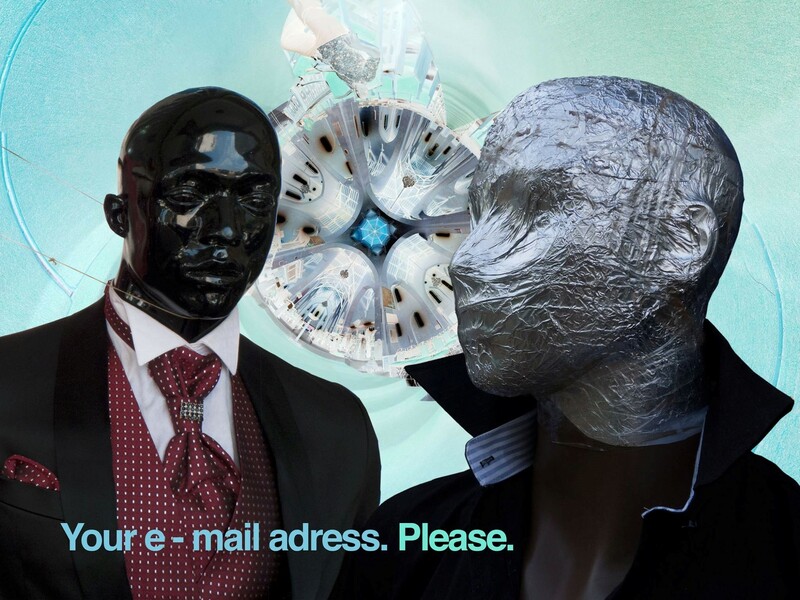 “Five years ago, many artists were mass-producing work that began to look very similar.” Wasswa says he realised you can’t produce work solely in view of where it could sell. Though he recognised you have to “evaluate a little”. “It’s fine for a gallery to take your work but they need to promote it, which they are currently not doing” says Wasswa. Currently the city’s galleries will hardly inspire major collectors anyway; most are a few small rooms inside cramped bungalows with little if any lighting. Kampala urgently needs a large building with clean bright white spaces to honour its artists’ work. “Some of us are thinking of developing a contemporary art gallery. We’ve looked at converting an old soap factory in Mbuya [a Kampala suburb]” he says. This was used in a one-off exhibition by the Goethe Institute some years ago and could be an interesting prospect. We talked about the practical and touristic appeal of a Village des Arts (Dakar) equivalent in Kampala. Referring to tinga tinga, the Tanzanian art movement, Wasswa tells me he and some artists are looking to buy land down in Masaka district, west of Lake Victoria, to construct a series of large studios. Clearly underfunding and government mismanagement means most of Uganda’s artists struggle to start, let alone survive. Wasswa describes the 2007 Commonwealth Heads of Government Meeting in Uganda, where artists were asked to submit their work which would be displayed around the city. “Pieces were lost. Artists didn’t get rent fees. I lost a piece of work somewhere in Entebbe airport” he says. “Money does go to the Ministry of Culture but doesn’t trickle down to artists” Wasswa concludes. 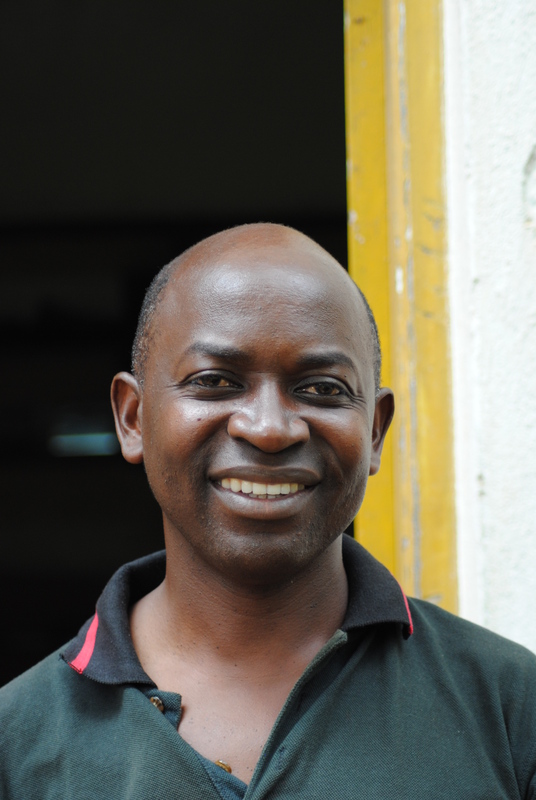 Bruno Sserunkuuma could be seen as one of the old guard, who has survived working in Uganda. 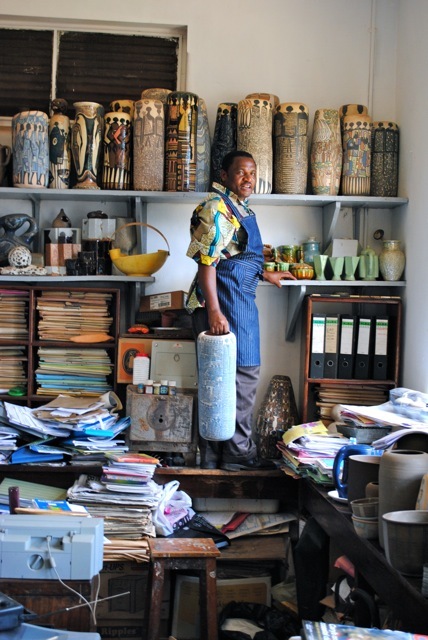 Originally a painter, Sserunkuuma became a potter who benefitted from his association as pupil and graduate fellow with Makerere University, a critical source of sustainable funding and resources as well as technical instruction. Sserunkuuma’s artistry has clearly been influenced by the vision of the original founder of Makerere’s School of Fine Art, Margaret Trowell. 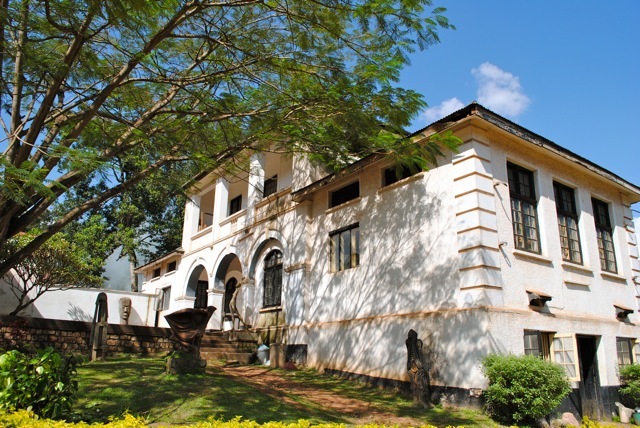 Director of Makerere Art School from 1939-45, Trowell represented a colonial pedagogy. She wished to respect existing traditional methods while introducing technical knowledge as a pragmatic way to develop the visual arts in a region where representational art was rare. ‘We start from it, study it, and honour it’ was her dictum. The ceramicist’s output is a product of this philosophy. He produces pots and vases that demonstrate both acute cultural sensitivity as well as clear technical mastery. Women feature heavily in his tall, minutely-detailed vases and pots. “I was very close to my mother and as a result the role of women, particularly in rural settings, is very prominent in my work”. 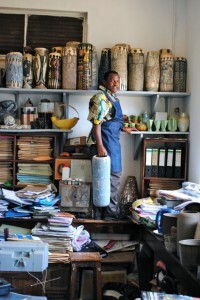 These pieces earned him 2nd prize in UNESCO’s Craft Prize for Africa in 2000. He has since exhibited globally. With further state and market investment as well publicity (a need identified by Kyeyune) an artist like Sserunkuuma could develop a genuinely global renown. Others would surely follow. Harry Johnstone is a freelance journalist with a background specialising in African History and International Relations. Who started art in uganda?